Have you ever heard of soul contracts? Soul contracts happen before you are born. We have soul contracts with every person we encounter, even strangers. A soul contract may last lifetimes, a life or it may be for just a moment. Each contract is to help the other person grow and evolve. For example, if you're a parent, you have a soul contract with your kids to help them grow and evolve and for them to help you evolve and grow. Your kids picked you to be their parent for the lessons that they need to learn during this lifetime. Sometimes it's the reminder of what love is. Sometimes this can mean you each bring forth a personality that is challenging for the other. You both agreed to this soul contract. Same agreement you made with your parents. Perhaps you have a difficult relationship with your father. He was physically or emotionally distant. This has taught you to be independent and shy away from letting others in. This could be the foundation to your growth and evolution. The Independence lead to career advancement but the emotional distance has been a challenge in your personal relationships. This will be something you work and evolve with during this lifetime. As you learn, your soul grows and you reach that next level of consciousness. Your soul knows what it needs. These soul contracts help with what each of us need to grow and evolve. Make no mistake, you're helping someone else evolve as well. The stranger in front of you at the grocery store that didn't have the 50 cents to make their purchase and you dig the two quarters out of your pocket, handed it to over to the cashier. That was a soul contract right there. We have no idea how it will help their soul evolve. We only know for ourselves and our own growth. Side note: Soul contracts do not give anyone the right or an excuse to be a jerk. When we reflect on a situation; our part and the parts of others, this is meant to help us and aid in our healing. Have no doubts that we are all healing from something. As we heal, we grow and become our best selves. That's not to say you're not loveable or a great version of yourself already. You didn't come to this planet, at this time, to not grow and be challenged. Your soul needs it. And the world needs you to work on yourself and heal. Today notice the people coming into your life. Each person from your significant other to those you work with is an opportunity to grow and evolve. 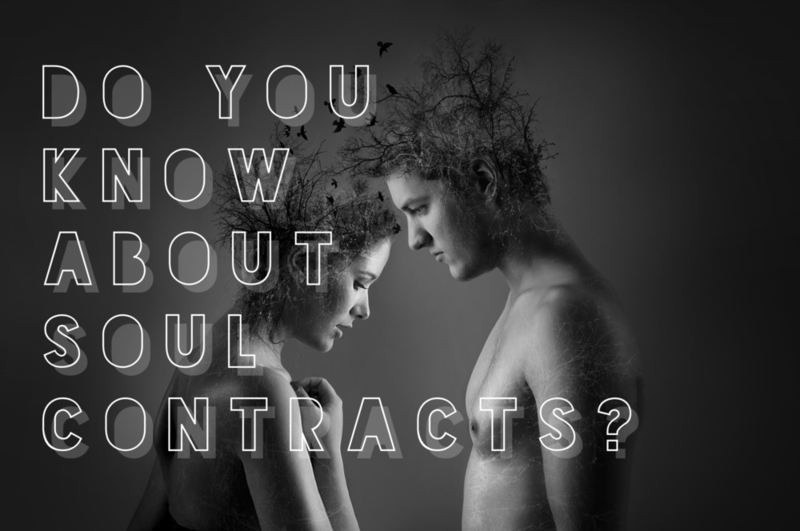 What if you knew the soul contracts you had with people? Would that soften the blow when someone hurts you? Or when your children are driving you batty? Or when a customer is a jerk? Perhaps when you have an incredible moment of a miracle you will see how a soul contract benefits you? Or perhaps you have more patience with all those around you because after all, we are here to help each other. Want to learn more about love, join the Love School here. This is where we dive deep into self love, interpersonal and romantic relationships.